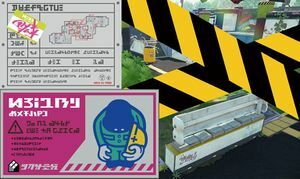 Version 2.0.0 was a major update to Splatoon, which took place on 6 August 2015 at 02:00 UTC. Some hotly-anticipated features made their debut, such as additional game modes, new weapons and new gear. 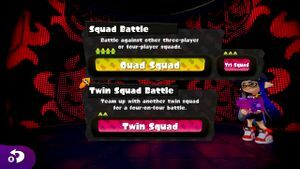 Two new modes were introduced, Squad Battle and Private Battle. Quad Squad - A full team of four friends participates against an opposing Squad. Tri Squad - A grizzled team of three friends participates against an opposing Squad, which may consist of four players. Penalties and rewards are the same, except a Tri Squad will respawn slightly faster. Twin Squad - A team of two friends is paired with another Twin Squad on a team, then plays against a pair of opposing Squads. Players participating in Squad Battles receive the usual rewards for Ranked Battles, but the mode cannot be used to increase a player's rank above A+ (see below). Private Battle allows players to set up customized matches between only friends and friends of friends. All stages and game modes are available and the host sets up the teams. The host can create even battles (such as 1v1 or 4v4) or uneven battles (such as 1v4 or 3v2). However, there can only be up to four players per team, and the host cannot assign everyone to the same team. No battle points, cash or level experience are rewarded for Private Battles. If the player inks between 200 and 399 turf, they receive one point. 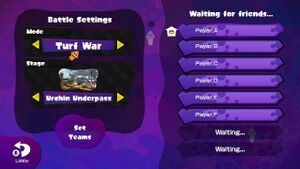 If the player inks 400 or more turf, they instead receive two points. If the player's team wins, the player receives an additional three points (for a maximum of five per battle). 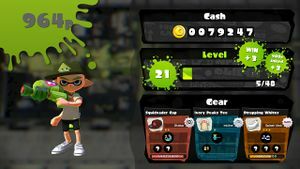 In Splat Zones, and Tower Control, players receive one point for each minute their team survives. If the player's team wins by timeout, team members will receive an additional three points. If the player's team wins by knockout, team members receive ten points total. Players can now increase their rank to S and S+. Squad Battles are not allowed in the S ranks, however. A player whose rank changes in a Ranked Battle will be returned to the Lobby. Some new gear shown in a promo image. The overall layout of Urchin Underpass was adjusted in all modes. Trees were relocated, corners were cut, walls were opened up, and there is all-round more turf to ink. Other stages received layout changes in Ranked Battle modes. The long corridors on the sides are now open in the middle and the end is covered in un-inkable glass. The above combined with the addition of trees in the center area make sniping from the metal grate platform less viable. A new "high road" is present when coming from the spawn point, giving players another route back to the battle. Adjusted stage layout in Splat Zones. Adjusted stage layout in Splat Zones and Tower Control. Adjusted stage layout in Tower Control. Several tweaks were made to the game to improve the experience and enforce better mechanical balance. When deciding the winner of Splatfest, the percentage of battles won is now multiplied by four instead of two. Adjusted the sound effects for Inkstrike so it can be heard when it is about to strike on the left, right, or back of the player. Adjusted the sound effects for some of the longer range weapons so that they can be heard from far away when they hit. Corrected the amount of damage done by bombs when they are thrown against the Splash Wall. Will no longer fill the special gauge prior to the start of the match in the event of a disconnected teammate. Charge is now based strictly on turf inked rather than how the turf was inked. On average, The special gauge charges faster as a result of this change. This page was last edited on 14 April 2019, at 11:06. This page has been accessed 40,000 times.